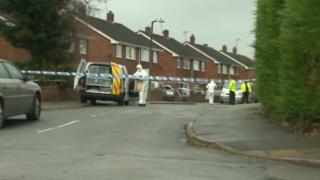 A woman has died following an incident at a property in Wrexham. North Wales Police and the Welsh Ambulance Service were called to Ffordd Mabon, Llay, Wrexham, at about 06:35 BST on Saturday morning after reports of a "medical emergency". The woman was taken to Wrexham Maelor Hospital but has since died. Police are treating the death as "unexplained" and officers are supporting the family. A police cordon has been set up and forensic officers are at the scene.